How Does Refinancing Your Student Loans Work? Is It a Good Idea to Refinance Your Student Loans? How Does Refinancing a Student Loan Affect Your Credit Score? Can You Refinance a Student Loan Without a Degree? Can You Refinance Student Loans While in School? Can You Refinance a Student Loan Multiple Times? Why Are Student Loans a Good Thing? Can Student Loans Be Forgiven After 10 Years? Can Student Loans Be Discharged After 20 Years? Are Student Loans Forgiven After 25 Years? Do You Have to Pay Back Student Loans If You Drop Out? You have graduated from school, have a degree, and are wondering what to do about all your student loans. You have several of them, at various interest rates — and some of the rates are quite high, costing you a good chunk of change each month. One solution for making this easier? You can refinance your student loans. Refinancing is the process of consolidating all your student loans with the potential of getting approved for a better interest rate. If you can lower an interest rate by a few points, you could potentially save thousands of dollars, which can be applied to your principal balance, helping you get out of debt even faster. 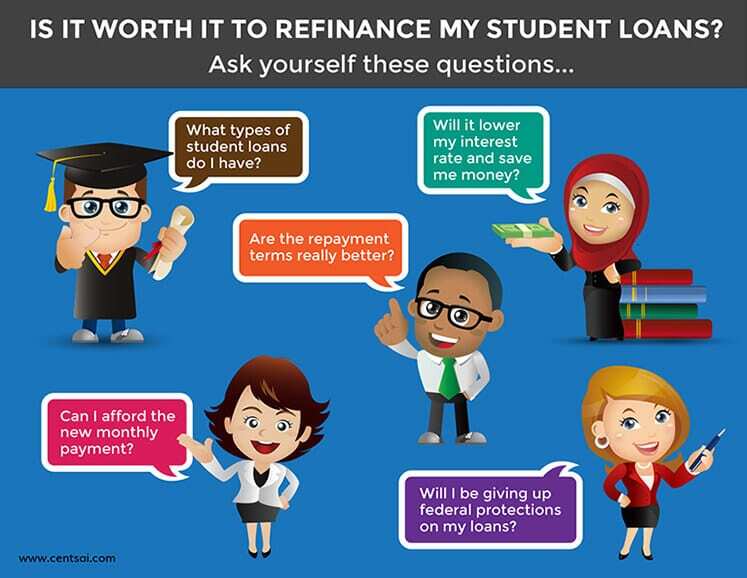 But what is refinancing student loans exactly, and what does it entail? Read on to learn more. The first thing you’re probably wondering is how does student loan refinancing work? Through the process of student loan refinancing, you pay off all your existing student loans with a refinancing loan, then have just one loan to pay back, probably at a better interest rate. So the two main perks of refinancing are minimizing your student loan payments by having only one loan and scoring a better interest rate to save you money. In order to refinance your student loans, you apply for a refinancing loan through a student loan refinancing company. These private companies provide such loans to eligible candidates. Your eligibility can vary company by company, but standard things like your credit score and income are taken into consideration. Once you’re approved, your current student loans will be paid off and you’ll have only the refinancing loan left. Then you make payments on your refinancing loan and save money on interest with a better rate. Take a look at our reviews of top student loan refinancing companies. At this point, you might think refinancing your student loans sounds intriguing. But when is the best time to refinance student loans? While there is no perfect answer, you’ll want to refinance when you have a stable job with income that can support the new loan. Student loan refinancing companies are private companies and want to ensure that you can pay back the loan. Because of this, they will look to your credit and income to determine if you’re an eligible candidate. You want to make sure that your income is more than your student loan amount, because they will most likely check your debt-to-income ratio. On top of that, you’ll want to wait to refinance your student loans until after you graduate and have a payment history to show. Some companies might allow you to refinance right after graduation; however, having a positive repayment history for several months may help your eligibility. Your income can support a new loan. Your debt-to-income ratio is low. You have a positive payment history for several months or more. Ready to refinance? Check out our buyer’s guide to figure out your student loan refinancing options. Given everything we’ve mentioned so far, refinancing your student loans can be a good idea if you’re looking to simplify your payments, change your repayment terms, and lower your interest rates. The benefits can outweigh the cons in some instances. It’s not a good idea to refinance your student loans if you are unemployed, have bad credit, or think you could benefit from federal student loan protections. Otherwise, refinancing can be a good idea if you find repayment terms and an interest rate that work better for you than your current situation. If you want to refinance student loans, you might be wondering if the process has any affect on your credit score. When you’re checking rates from various student loan refinancing companies, there might be a “soft pull” on your credit, which won’t affect your credit score. If you end up applying for a refinance loan, there will be a “hard pull” on your credit, which could lower your credit score by a few points. Why? Because opening new credit accounts are tracked and can affect your credit score. If you have too many applications for credit, this could be a warning sign to lenders that you are over-reliant on credit. So if you apply for multiple offers, it could hurt your credit score. In order to keep your score in good shape, only apply for one offer that best suits your needs. Also make full and timely payments on your current student loans until the refinancing loan has paid them off. Your payment history carries the most weight when it comes to your credit score, so you’ll want to ensure that you’re on top of all payments on both old student loans and the new refinancing loan. Does refinancing sounds like a good option for you? Take a look at expert reviews of top student loan refinancing companies. Refinancing student loans can be a great way to save money on interest and change your repayment terms to ones that work better for you. Many student loan refinancing companies may require that you have a college degree or a degree from an eligible institution. But if you didn’t graduate with a degree, there is hope to refinance student loans. You may have dropped out because of illness, family obligation, or even finances. Regardless, with Citizens Bank, you may be eligible to refinance your student loans without a degree. To qualify, you need to have a positive repayment history for at least a year. So if you didn’t graduate with a degree, your options to refinance student loans may be limited, but it’s still a possibility. If you’re thinking of refinancing your student loans, you might wonder if it’s even worth it. Will it be a smart move for you in the long run? Well, that all depends. If you have federal student loans, you have access to various repayment options, including income-driven plans that can put a cap on your monthly payments. You could be eligible for certain student loan forgiveness programs. By refinancing your student loans, you give up these protections. If you think that you’d benefit from an income-driven plan or want to apply for a forgiveness program, then no, refinancing is not worth it. On the other hand, if you want to get out of debt fast and don’t plan on opting into those programs, refinancing might be worth it for the cost savings alone. You could potentially save thousands of dollars in interest, which could then be applied to your principal balance. This would effectively shorten your repayment time and get out of debt even sooner than you thought. Also, you’ll want to carefully compare repayment terms and verify that you’re actually getting a good deal. If you are, make sure you’re 100 percent OK with giving up those federal protections on your student loans. If you have private student loans, there is less to consider, because your loans don’t come with the same repayment options and protections. Your interest rate is lower. You’re saving money on interest. Your repayment terms are better. You can manage your new monthly payments. You don’t need federal protections like an income-driven plan or forgiveness. If you think refinancing will be worth your while, you can check out your options using our student loan refinancing buyer’s guide. If you’re still in school and considering your student loan repayment strategy, you may have come across student loan refinancing. You may wonder if you can lock in a better interest rate while you’re in school through this sort of refinancing. Unfortunately, that’s not possible, as many student loan companies want eligible candidates to have graduated or not be in school. These companies want to see that you have a positive repayment history and have income and employment to support a new loan. Also, while you’re in school you still may have more loans coming your way and you’ll want to refinance your student loans when you know your final balance. When you start to look into the details of your student loans, you might be alarmed when you see your interest rate. Even worse, you might realize just how much that interest rate is costing you per month or even per day. Fortunately, there are a couple of ways you can lower the interest rate on your student loans. The first is to sign up for auto pay. If you have federal student loans, many loan services offer an auto pay interest rate reduction of 0.25 percent. 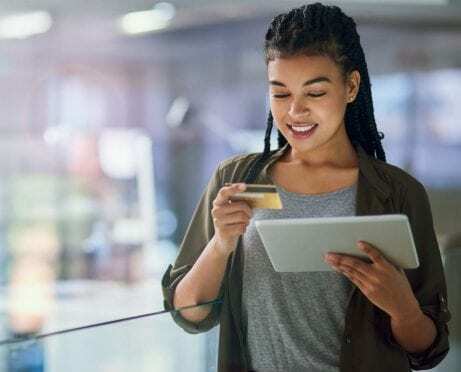 To make this work, you’ll want to be sure you have enough in your account when the automatic withdrawal occurs, or you will potentially face overdraft fees. 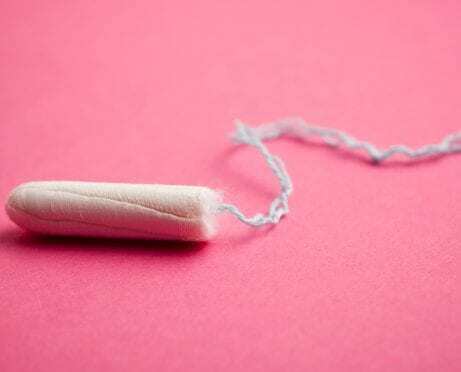 You may seem to you that a 0.25 percent reduction isn’t that much, but anything can help. If you want to get an even lower interest rate on your student loans, the only way to do that is through refinancing. Just as you would refinance a mortgage, you can refinance your student loans with a student loan refinance companies. By applying for a refinance loan, you will hopefully get approved for a lower interest rate than you currently have. Just how much though? It depends on your credit as well as the company. Ideally, you’d get a few points off your interest rate and save a good chunk of interest. When you’re shopping around and looking at various student loan refinancing companies, you might be curious about which one is the best option. Because of their similarities, it can be hard to choose. It’s important to look at rates, repayment terms, and the terms and conditions in the fine print. But what if you refinance with one company and realize you made a mistake and want to refinance again with another company? Can you refinance a student loan more than once? The answer is yes. You can refinance student loans multiple times, but it might not be the best idea. Doing it once might be OK, but doing it more than that could have a long-term effect on your credit, because applying for several loans can result in a drop in your credit score. So while refinancing your student loans more than once is possible, carefully consider whether it is a good strategy for you. Get it right the first time by finding the right student loan refinancing company for your needs. Before you refinance your student loans, you’ll want to explore all your other options. In some cases, you may be eligible for student loan forgiveness. Student loan forgiveness is one of the perks of having federal student loans. With every income-driven plan, your loans will be forgiven if you have a balance after a repayment period of 20 to 25 years. While that may seem like an obvious option to explore, it’s not the best one if you can afford to pay off your student loans sooner. If your student loans are unmanageable, opting for an income-driven plan and working toward student loan forgiveness can be a lifesaver. It’s important to note though that your forgiven balance is considered taxable income, so while your loans may be forgiven, you could be hit with a big tax bill, depending on your situation. Those who work in the public sector or at a qualified nonprofit may be eligible for the Public Service Loan Forgiveness program. Through this program, eligible candidates can get their student loans forgiven after 10 years of service and monthly payments. The good news is that through this program, your forgiven balance is not considered taxable income. Student loan forgiveness has its own pros and cons, which should be considered carefully. It should also be used only if it’s really necessary. If you can afford to pay back your student loans earlier, do so and ditch debt for good. Ready to speed up your debt payoff? Find the best student loan refinancing companies to help you make it happen. Let’s face it, you might feel burdened by your student loans and hopeless about paying them back. Fortunately, refinancing student loans may be able to provide you with better terms than you initially had. 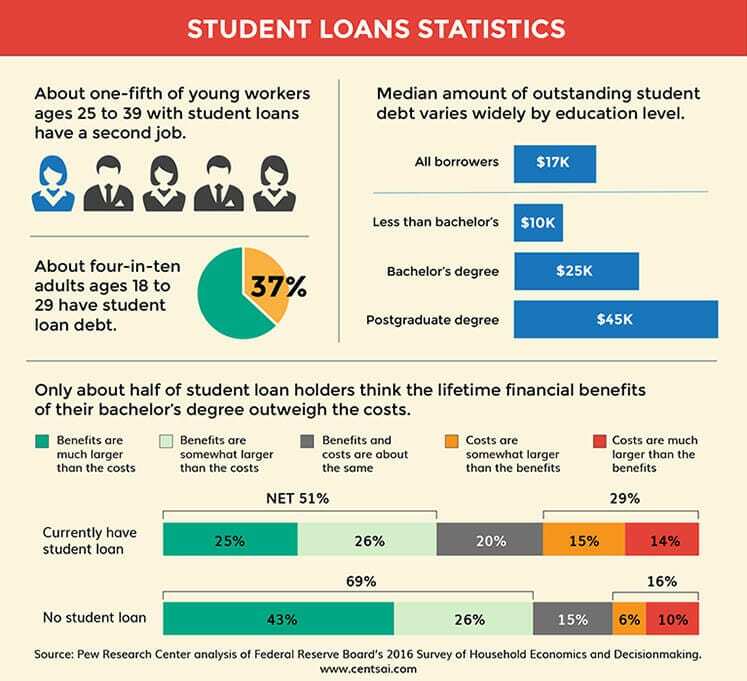 Though student loans can be tough to manage, they aren’t necessarily a bad thing. They can help you pursue higher education and get a degree. In turn, with your education and degree, you may be able to get a better job and have a brighter future. The best part is that federal student loans have various protections to help borrowers. They also have fairly low interest rates, at least compared with credit cards. It’s okay to hate your student loans, but it’s important to understand why they can be good things to have. You’re stuck with student loans and wondering what are ways you can get rid of them ASAP, without refinancing. The best option is to work in the public sector or at a qualified nonprofit under the Public Service Loan Forgiveness Program. You must work full-time and your job must qualify for the program. After 10 years of service and payments, your student loans will be forgiven. Under the Public Service Loan Forgiveness Program, the forgiven amount will not be considered taxable income. If you have student loans, you might wonder if you can get them discharged after a certain period of time. Under certain income-driven plans, you can have your student loans discharged — that is, forgiven — after 20 years. In order to qualify, you must make consistent payments and opt in each year with your loan servicer. If you can afford to get out of debt earlier, refinancing may be a better option. You can save money on interest and pay down the principal balance. However, if you have federal student loans that are cumbersome and tough to manage, opting for an income-driven plan could be a much-needed help. Federal student loan borrowers have a serious perk with income-driven plans: student loan forgiveness. Under these plans, your monthly payments are based on a percentage of your income. You pay that amount for a specific repayment term, and if there is a balance at the end of the repayment term, your loans will be forgiven. Under certain income-driven plans, your loans will be forgiven after 25 years. Some of these plans may also forgive loans after 20 years; it just depends on when your student loans were disbursed. Dropping out of college can be a tough decision. Maybe you realize college isn’t for you, or it’s just too expensive, or you have family obligations. Regardless of your reason, dropping out does have ramifications if you have student loans. Just because you aren’t in school doesn’t magically make your student loans disappear (sad, I know). In fact, you’ll be responsible for all the student loans that have been disbursed to you and used for the classes you have taken. The good news is you may have a grace period of six months, during which you don’t have to pay back your loans. But once that grace period is over, you’ll be on the hook for the student loans you did take out, even if you dropped out and don’t have a degree. Check out our student loan refinancing buyer’s guide to find your best refinancing options. Death can seem like such a morbid topic, but if you have student loans, you might wonder if they’ll be forgiven or passed on to your family. If you have federal student loans, they will be discharged if you die. Your family will need to provide a proof-of-death certificate in order for that to happen. If you have private student loans, the answer isn’t as great. Private student loans aren’t automatically discharged upon death, and the lender may go after the estate or the cosigner to pay them off. It’s important to ask your private student loan lender what its death discharge policy is. Have you ever thought, How can I get rid of my student loans? If you have, you’re not alone. You might wish that with a snap of your fingers, your loans would just disappear. Of course, that’s not possible, but getting them discharged is — in rare circumstances. First, you can get your federal student loans discharged in bankruptcy, but only if you can prove that paying them would be a serious hardship for you. It’s best to opt for an income-driven plan, in which your payments could be zero dollars if you have no to low income. Other ways that student loans can discharged are through death and permanent disability. If you die, your federal student loans will be discharged. If you become unable to work due to permanent disability, you may be able to get your loans discharged through a Total and Permanent Disability (TPD) discharge. If this is something that would benefit you, you can apply at DisabilityDischarge.com. Paying back your student loans can be a drag, and with interest, it can all add up and be quite expensive. Refinancing student loans can be a way to get a better rate and save money on interest. It can also help you change your repayment terms to ones that will work for you and your lifestyle. Just be clear about the drawbacks, such as giving up federal protections. You’ll also want to make sure you can handle your new monthly payment. If you’ve done your research and are in a good place with your career and finances, refinancing could help you pay off your student loans faster and save you some money.